I'm kind of feeling like crop tops are my signature piece on this blog at this point (and I also do have that faux crop tutorial coming up) but I swear, they are the perfect clothing item for this time of year. A crop top and a knee length skirt is the perfect combination--demure, but not overly sweet. I returned to my standby vintage pattern, Simplicity 3480 for the top. I'm still not sure what year it's from, but I assume early 60s. I love this pattern! I just realized that in fact, I have never made it as written--it is supposed to have a button back. I have put a zipper in before, but since I don't need it to get in and out, it's just as easy to leave it off entirely. My skirt is an extra-full (three widths of fabric) dirndl with a flat waistband and a hook and eye closure for a neat look. It's so simple, but the hook and eye and invisible finishes give it a professional finish. And y'all! If you are one of allie J. 's non-sewing readers, I am super excited to tell you that if you want to learn how to make a skirt like this--you can take my brand new Skillshare class!! It's a step-by-step video lesson that will take you from inspiration to completed garment, and teach you everything you need to know to design and sew a beautiful gathered skirt. 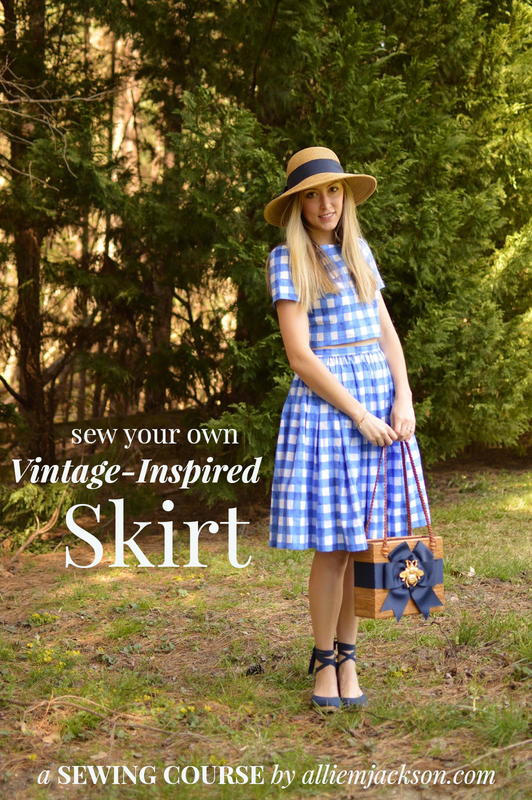 "In this class, you’ll turn inspiration into reality as you select the style you want to create, then master the skills needed to turn a flat piece of material into a fun vintage-style skirt, including fool-proof gathering, the easiest ever zipper insertion, and creating an invisible hem. We’ll be using a mixture of hand- and machine-sewing for the best possible finish--with the least time investment. Some sewing experience is required--you’ll need to know how to use a needle and thread, how to operate your machine, and how to sew a straight line. When you’ve completed the class, you’ll twirl away in your very own custom skirt, ready to go anywhere from brunch to the ballroom." When Skillshare reached out to me, I was like yeah, making a sewing class sounds fun, but I have no video skills whatsoever. Fortunately, I had a great videographer--Taylor made it so fun even though it took about 6 hours to make this skirt, at least twice as long as usual. I had so much fun putting this class together, and I really, really hope y'all love it as much as I do. You can click here to sign up for Skillshare and get three months of premium free (the regular membership is always free!). I've been taking some of the other classes--there's some really good ones on design, branding, and photography. ps: i really, really hope you like it! also--while you're signing up for skillshare classes, sign up for ada spragg's! This is a great set! I recently finished a crop top/skirt combo myself. I hadn't heard of skillshare yet. I'll have to check out their classes. Thanks so much! I like that you get a membership that allows you to take ALL THE CLASSES as opposed to buying individual classes like craftsy. There's less sewing on there now (although it seems Skillshare is trying to change that) but there's tons of good resources for bloggers and creatives! Adorable outfit! I have a serious crush on retro crop tops and you aren't helping with that! Haha. I LOVE them. If you get one you wont be disappointed! 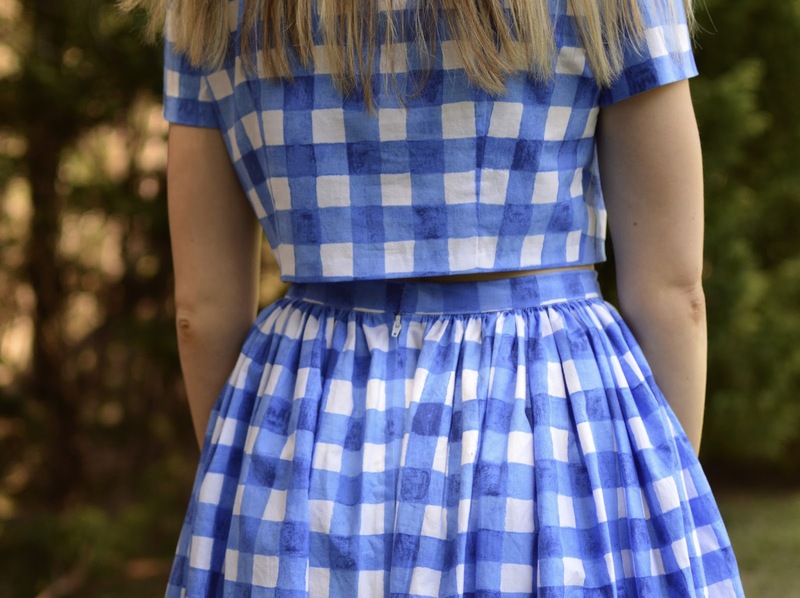 Yay, gingham! I love you fabric choice for this outfit. So pretty! 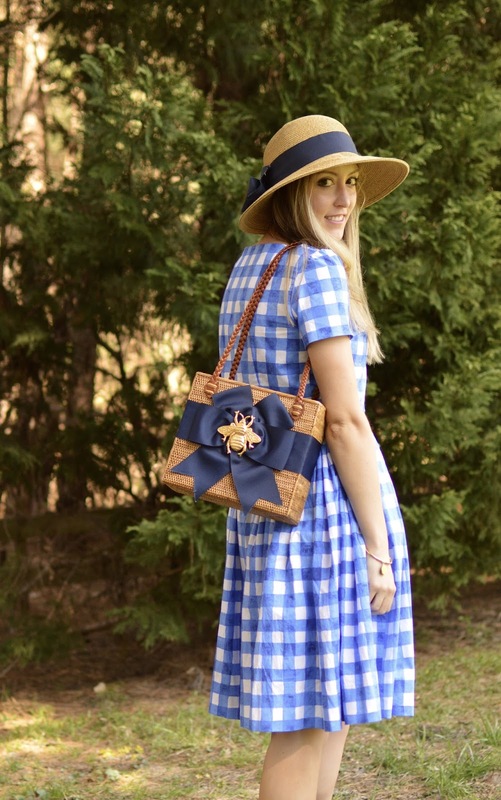 You look like you're ready for a picnic. You're also making me wish it was warmer where I live... I'm inspired to try a crop top too. Simplicity #3480 is from either 1959 or 1960, as far as I can tell. You see, I have a bunch of patterns from all the decades and laid their info out in an Excel sheet. This graph often helps me date patterns I don't know a year for - so I have a Simplicity #3161 from 1959 and then a Simplicity #3769 from 1961. I really don't think #3480 made it that far into '61. Hope this helps! IS THAT HOW THEY WORK? This is silly but I never understood how they numbering on patterns work, it seems so random!! Well, that's kind of how it works...every so many years the numbering starts all over again. Its still a bit random, but when all the numbers laid out I can kind of predict pattern dates (most of the time). For example, Simplicity patterns only got numbered to about 5000 in 1954 when they switched back to 1100 in 1955 and took this up to about 9500 in 1971. Then they started numbering at 5000 in 1972. Nonsense, but it helps me know which year I'm sewing. Keep up the great sewing! Totally adorable outfit! I went to the Joannes today and bought some very bright fabric so that I can follow along with your class and make myself a new skirt! Congratulations! I love this look! I've been obsessing over crop tops with skirts... some that show just a little bit of skin. Good job!